On Monday, February 13th 2017 Susan Obry, a Master Composter, presented a workshop called “Garbage Into Gold: How to Compost Your Food and Yard Waste” at the Racine Public Library. This workshop was one in a series by Green Racine Learn and Share Programs, in cooperation with Greening Greater Racine. After retiring from being a nurse and nurse educator, Susan Obry became a Master Gardener. She then decided to become a Master Composter. At this workshop she discussed how to compost, covering all the basics for those looking to start composting, as well as troubleshooting tips for those who have already started. 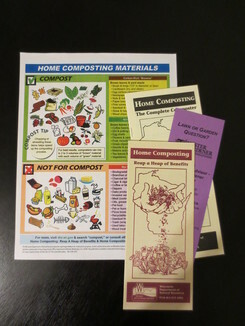 She also gave out handouts and brochures to take home with helpful information on composting. First she explained what compost is; organic material that has been decomposed into rich soil amendment. Composting is beneficial because it cuts down on garbage waste and once the compost is finished it can be used to improve the soil in your yard and around your plants. She then explained the process of making compost, including what types of materials to put in and not to put in a compost pile and how to have a balanced ratio of 3:1 Carbon-rich “Browns” to Nitrogen-rich “Greens”. “Browns” include materials such as cardboard, nuts, paper, and wood chips. “Greens” include materials such as coffee grounds, yard plants, grass clippings, fruits, and vegetables. She discussed different ways to compost, such as hot vs. cold piles, using a bin vs. just leaving it as a pile, composting in your kitchen, in the winter, and vermicomposting. She also went over how to tell when the compost is finished and how to use it properly. This workshop demonstrated the benefits of composting and provided useful information and resources on how to compost at home. Thank you Susan!